Although it’s the easiest time of year to enjoy fresh, local produce, it’s easy to get caught up in the summer celebrations full of drinks and not-so-healthy food. 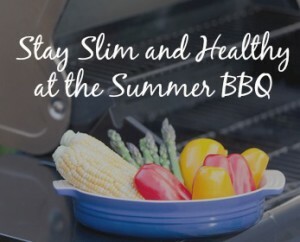 Since it is healthy to spend time laughing with friends and family, here are some tips to enjoy the food and the company, while staying slim and healthy. Load up on fruits and veggies first. Fresh and raw are the most nutritious, grilled is fine, if not too grilled (black = carcinogens, or cancer-causing compounds). If you only see creamy, heavy dressings, make your own quickie salad dressing with a splash of oil and vinegar, some pepper and lemon juice, and even a bit of mashed avocado or diced tomatoes. If having a burger, make it a veggie burger (these are my favorites, all of the varieties are pretty great) to avoid factory-farmed meat laced with saturated fat, hormones, and antibiotics. Bringing your own is usually appreciated, especially at a casual gathering. Skip the burger bun, load up with veggies and eat with a fork. Most buns are nutritional zeros and give you empty carbs. Avocado is much better for you than mayo. Stay hydrated! If you are hydrated, you will be less ravenous, and you’ll keep your digestion working properly. Avoid commercial potato salad and other “creamy” salads, which tend to be very high in unhealthy fats, sodium, and chemicals. If they are home-made, tread lightly, the same facts may hold true. Make your contribution to the table a healthy one, so that you are satiated. I always bring a flavorful dish that I know I can eat, so that I’m sure I won’t go hungry and load up on junk. Quinoa salads, kale salads, or gluten-free treats all work well, and usually are happily received by others trying to stay more on track. You may inspire someone else by having great-tasting, healthy food. I’m often asked to bring my kale and quinoa salad now, it’s always a hit. Load your plate rather than “grazing” on the food. You’ll eat less. It’s true. Instead of sugary drinks, make a “mocktail”: mineral water with a splash of juice and fresh lime with either basil or mint. Very refreshing and low in sugar. If you imbibe other alcoholic drinks, rotate water with each cocktail or glass of wine. Skip the greasy chips which are probably GMO, fried in unhealthy oil, and sky-high in sodium. If you’re missing that salty flavor, grab some dill pickles. If you’ve loaded up your plate with healthy food, go ahead and indulge in a little dessert, just keep it small. Fresh berries are the best pick, but a small serving of something is also fine for special occasions. Be present with what you’re eating, and chew! Take a moment and count how many times you chew before swallowing. Is it almost liquid? If not, slow down. You’ll probably eat less, and you may really taste (and enjoy) your food. The most important thing about the gathering is the company, but enjoy the food. If you know it’s going to be one big buffet of “junk food”, eat before you go, and pick a few bites of a couple of things just to be social. If you realize you’ve overdone it, stop eating and start drinking more water. The next day, just get back on track, without guilt, which only perpetuates a negative cycle. Drinking lemon water throughout the next day is very helpful to “detox” and rehydrate. Get some exercise, just walking does wonders for the body, especially if you typically sit a lot. I know this may sound a bit odd, but another thing to get back on track is to go outside barefoot, or better yet sit or lie down on the grass for awhile. It won’t make you lose weight on its own, but it does let you release positive ions and get some grounding earth energy, which makes you feel better and more aligned. Any time I need a boost, I find that going outside and getting fresh air and connecting with the earth is very healing. It feels great, and it’s scientifically proven to be beneficial to us humans. Now that you have some guidelines, and some “recovery” tricks, go enjoy! Do you have any favorite plant-based dishes you like to bring to summer parties? If so, please share them below. Happy Summer!